The global home healthcare software market is estimated to reach $6.4 billion by 2018, at a CAGR of 13.4% between 2013 and 2018. The market will be driven by skyrocketing healthcare cost, spiralling aging population that increases the incidences of chronic disorders, hospital readmission reduction program by U.S., shortage of nursing and doctors staff, OASIS documentation, and favorable government initiatives. However, rising incidences of data breach and loss of confidentiality, high maintenance and service expenses, and shortage of trained IT professionals are the factors that will hinder the market growth. The technologies that changed the face of home healthcare software market are cloud computing, mobile health applications, telehealth, business analytical tools and integration of homecare software. The adoption of these technologies has resulted in the enhancement of quality care at home and lowered down the cost incurred in implementing homecare IT solutions. Cloud computing mode of delivery of home healthcare software, robust adoption of smartphones, tablets, and PDA will elicit the demand of this software in coming years. 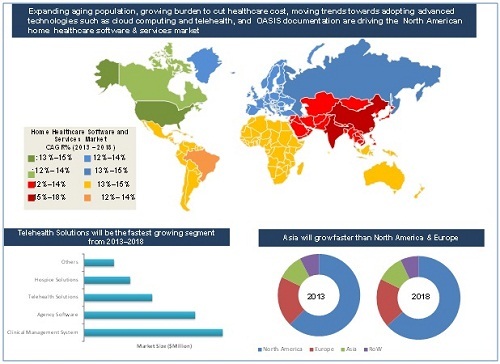 Geographic analysis reveals that North America is the largest contributor to the global home healthcare software market while Asia is expected to grow at the highest rate. Asia (China, India, and South Korea), Middle East (Saudi Arabia, Qatar), and Latin America (Brazil) are also poised to grow at double-digit CAGRs in the coming years. The key players in the market are Agfa Healthcare (Belgium), Allscripts Healthcare Solutions, Inc. (U.S.), athenahealth, Inc. (U.S.), Cerner Corporation (U.S.), Carestream Health, Inc. (U.S.), Epic (U.S.)., GE Healthcare (U.K.), McKesson Corporation (U.S.), MEDITECH (U.S.), NextGen Healthcare Information System LLC (U.S.), Novarad Corporation (U.S.), and Siemens Healthcare (Germany). The study covers the revenue market of four major classes of global home healthcare software market - agency software, hospice solutions, clinical management systems, and telehealth solutions. Both clinical and non-clinical applications have been covered in the study. Home Healthcare software is IT solutions designed to provide care at home by homecare agency, hospice agency, private duty, and nursing centres among others. The key role of homecare software is to manage the vast patient clinical data and fasten the process of administrative task. Home healthcare IT services definition includes the cost charged to the enterprises by the vendor for implementation, maintenance and post sales services, training and education, up gradation, integration, and interoperability services. Notable exclusions from IT services include consulting services, outsourcing services, and infrastructure management services. The home healthcare software market is segmented based on products, applications, delivery modes, components, and end user. Based on products, the home healthcare market is further segmented into agency software, clinical management system, hospice solution, and telehealth solution. Of all, clinical management solutions and telehomecare will be the fastest growing markets in the given forecast period. By application, home healthcare software market is divided into clinical and non-clinical. The clinical segment comprises of homecare-EMR, medication management, electronic point-of-care documentation, and others including physicians portal. On the other hand, the non-clinical homecare software is segmented into billing and scheduling, homecare-CRM, accounting, payroll, and others. Non-clinical applications accounted for the largest share of the global home healthcare software and services market in 2013 and clinical applications are estimated to grow at a higher CAGR from 2013 to 2018. The three most important delivery modes considered for the study are web-based, on-premises, and cloud computing. To understand the end-user perspective, the homecare software market is divided into homecare agency, hospice agency, private duty, and other including rehabilitation center. Homecare agency accounted for the largest share and private duty center is likely to grow at the fastest rate in the coming years. Above all, the market study also covers the usage mode used as platforms for installing the software. The two usage modes are handheld devices, and laptop/desktop. The global home healthcare software market is estimated to reach $6.4 billion by 2018 at a CAGR of 13.4% during the forecast period (2013–2018). A major factor that propels the growth of the market is the increasing demand for IT solutions that are capable of addressing numerous issues related to data storage, retrieval, and accessibility which in turn helps to reduce costs and improve the quality of care. Integrated homecare software products emerged as an effective tool to resolve the issue of medication errors, and to curtail the growing healthcare cost. Apart from this, factors such as government initiatives and various incentive plans for homecare providers, growing aging population, and high prevalence of chronic disorders across the globe will foster the adoption of homecare software. The adoption of new technologies such as mobile health, telehealth, and cloud-based model offers huge potential opportunity for growth in the homecare software market. Further, the introduction of ICD-10 conversion system will increase the demand for new software development and testing, thereby offering huge opportunities to homecare IT vendors. The major bottlenecks for the growth of the market are growing concerns over security, interoperability issues, integration challenges, poor IT skills among staff, and weak financial support from governments in certain regions of Europe, and Asia,. Emerging markets like China, India, Brazil, South Korea, and Saudi Arabia represent a lucrative growth opportunity for investors. The key players in home healthcare software market are Agfa Healthcare (Belgium), Allscripts Healthcare Solutions, Inc. (U.S.), athenahealth, Inc. (U.S.), Cerner Corporation (U.S.), Carestream Health, Inc. (U.S.), Epic (U.S.)., GE Healthcare (U.K.),McKesson Corporation (U.S.), MEDITECH (U.S.), NextGen Healthcare Information System LLC (U.S.), Novarad Corporation (U.S.),and Siemens Healthcare (Germany). 13.1 Allscripts Healthcare Solutions, Inc.
*Details On Business Overview, Products & Services, Financials, Strategy, & Recent Developments Might Not Be Captured In Case Of Unlisted Companies.